The modern presidency is increasingly seen as in trouble by all sides of the political spectrum and by people of the most diverse political views. Understanding why this is the case requires examining the basic principles of the presidency itself, and there is no better place to start than William Howard Taft's Popular Government. His views on executive power and constitutional interpretation of this power are not rooted in nostalgia. Instead, Taft describes how and why the Progressive Movement marked one of the major turning points in American political thought. 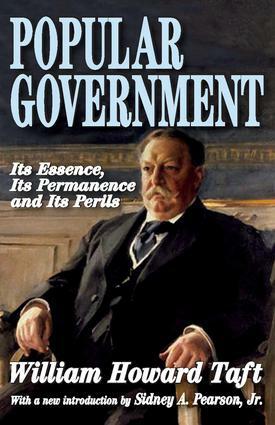 Taft wrote out of concern over the nature of the American system itself. He sought to describe the founding principles of the country, arguing that grasping these is essential for Americans' understanding of themselves as a people and for their daily exercise of citizenship. The concerns he addressed remain central today. Th at is because Taft's quarrels with the liberal-progressive tradition in politics have not yet completely played themselves out, either in academic life, or in the political arena. In a brilliant new introduction, Sidney Pearson argues that neither Roosevelt nor Wilson should be viewed as enemies of free government by any serious student of American political thought, nor should Taft be so regarded either. The concerns Taft engages remain important for any understanding of the problems that confront the American experiment in popular government. Popular Government is a basic introduction to debate about the nature of the presidency and the larger constitutional context in which such arguments take place. Th ere is no better way to gain perspective on the debate than reading this volume. "In Order to Form a More Perfect Union" 122 VII. "To Establish Justice"
"To Insure Domestic Tranquillity, Pro- vide for the Common Defense"